You Must Choose One | Are You An Existing Customer? Is Shipping Address Different Than Billing? All of our remaining cassette tape stock has been allotted to current orders. We are expecting new tape to arrive during the week of March 18th and are currently scheduling for early May ship dates. Lengths will be limited to 35 minutes per side as no one will be manufacturing 90 tape stock in the foreseeable future. 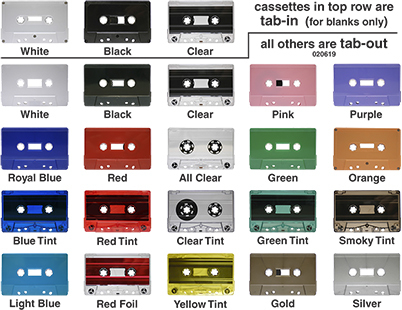 List quantity, tape type, TOTAL length and color in 'Cassette Info' section. List quantity, tape type, TOTAL length and color in 'Cassette Info' section, and indicate ink color and whether one or both sides are to be imprinted in 'Label Info' section. Include art files or links to files in appropriate area of 'Art Files' section. If you are sending files, please put all of the art files into one folder, and the audio files in another folder, archive the folders and send us the zipped files via any of the free file transfer services (WeTransfer, YouSendIt, Dropbox, etc.). Just paste the links into one of the boxes provided in the Art and Audio sections. Thank you. one for side A, one for side B.
artist information on the disc(s). If you are sending audio files via a transfer service (We Transfer / SendSpace / Dropbox, etc. ), please provide the link to the files below. To avoid additional mastering charges If you are sending files, please provide two 16 bit 44.1kHz PCM audio files (WAV or AIFF) - one for side A, one for side B.